How does a nonprofit organization manage to stay in business and continue to grow and thrive even in a recession? “You have to think of it not as a charity, but as a business,” says Jim Teter, CEO of Goodwill of Central Arizona, who spoke at this month’s CEO Lecture Series in Ethington Theatre on Wednesday morning. “The nonprofit label is just your tax status,” says Teter, who, in the three and a half years he has been CEO, has seen his Goodwill branch go from one day’s worth of cash on hand to 47 days — and whittled $29 million of debt down to $11 million. 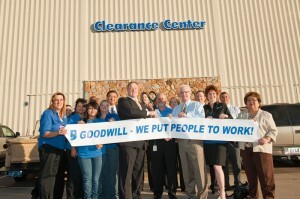 Jim Teter and staff open a new Goodwill clearance center in Phoenix. Teter admits that comes with its share of challenges. One of the challenges Goodwill faces is perception. Not many know or truly understand what Goodwill does, and in response the organization has launched a new marketing campaign focusing on several different audiences. Goodwill originally started as a mission of the Methodist Church to help people with disabilities find jobs. Today, it has expanded to help all types of people find work, from those who have a disability to those who have been unemployed for more than a year or lack certain skill sets. Last year, Goodwill of Central Arizona set a record by helping 3,500 people. It was able to raise $88 million through its retail stores in Maricopa County, Yuma and Prescott. About 92 cents of every dollar goes toward its mission, with the majority of the money staying in Arizona. The portion that leaves the state is used for paying out-of-state landlords and for national yearly dues. This translates into a $300 million economic impact for Arizona — which is more than the Fiesta Bowl brings in. But how does a nonprofit organization manage this type of business model? According to Teter, there are several factors. They are able to do this in several different ways. Goods that don’t make the cut to be sold in stores get sent to a clearance warehouse, where people pay for items by the pound. If it can’t be sold at the warehouse, it goes into salvage. Goodwill has about 12 different ways of sorting for salvage. It has a deal with Dell, which buys all computers, no matter the brand. Similar deals are in place for things such as televisions and other electronics. Used booksellers come in and buy books in bulk for resale at their own stores. Every year, Goodwill of Central Arizona keeps 100 million pounds of items from going into the landfill. All of this is done for the main mission of Goodwill: to put people to work. Aside from providing hundreds of jobs itself, both in 47 stores and as the largest commercial service provider in Arizona, Goodwill uses the money made from retail to provide career centers. The career centers help people create resumés, find skills that are needed, provide job fairs where an employer has to have jobs available in order to attend, and provide access to search engines such as jobing.com for job searches. They also provide a three-week training program that teaches customer service skills, Microsoft Office programs and interviewing. Each person who completes this program also receives four credit hours at any Maricopa Community College. All of this is done free of charge to the job seeker. Another thing that makes Goodwill of Central Arizona so successful, he says, is a concept that that has been touched on by almost all of the speakers in the CEO series and has a huge believer in KBCOB Dean Kevin Barksdale. “As CEO of any organization, you have to surround yourself with great people,” Teter says. Passion from people who are excited about what they do, because that excitement is contagious. Respect for themselves, for the company and for the people they serve. Integrity. Retail has a high theft rate, especially among employees, and Goodwill’s survival depends on employees’ honesty. Excellence as the goal every day. Reach Jennifer Willis at 639.7383 or Jennifer.willis@gcu.edu.